Winkie’s made me cry. Yours seems to me to be about chilling killing power. She turns it to the personal. They just killed us. . . You wrote from the viewpoint of the man as cold killer, and Winkie wrote from the viewpoint of the victims. What?? was my reaction. Never having intended anything like that, I asked for clarification. 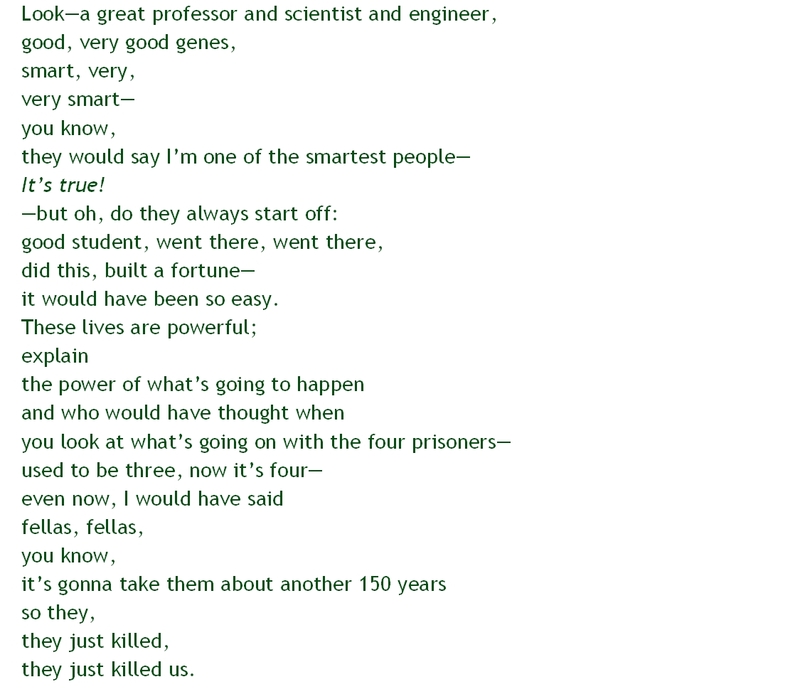 Yours is a man bragging, “smart, very smart, etc.,” connecting himself with past brilliance. Then the voice slides into nuclear stuff. And power. The forces he speaks of used their intelligence and their power to kill—and as in dreams, these fragmentary statements are about the self of the speaker. He is a cold killer. He is also blaming others. I created my found poems, this one included, based purely on instinct—or intuition, or a kind of ear—without thinking too much. If I thought anything, it was that I was distilling an essence of Trump. It was more about the rhythm or the music of the language, his stream-of-consciousness thought process and his repetition, than about concepts. There’s something so destructive of clear cognition in the way he uses language. So I told Sallie it was startling to receive such a specific conceptual interpretation. When a reader finds something one has done “purely by instinct” to have a meaning one hasn’t intended, it has more credibility than if you had had a conscious vision and the reader is seeing something else. You can see why we make such a successful mentor/mentee pair. 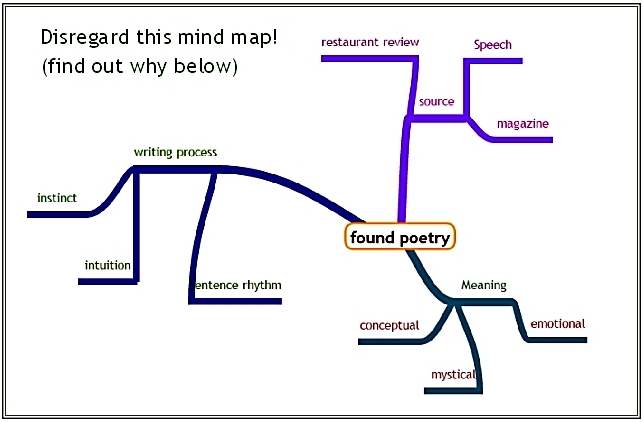 This experience of producing poetry made me think about how we produce meaning. My normal mode is writing nonfiction that requires deep, intensive thinking to make a point or argument clear. I think linearly—a mind map makes me dizzy. (That’s why the one above is so feeble. Besides, it’s ex post facto.) Nevertheless there’s a lot of intuition in my writing process: it’s by listening to the rhythm of the sentences that I determine whether I’ve really said what I mean. But in these found poems that’s all I listened to. And if I created meaning, it was one I was unaware of (not something you could say about my books). So is that a different degree/type/level of meaning? Wonderful stuff, both of you. Now you should try your hands with the Swedish statement!